Panchaea: In Search of an Equal Utopia & a Willing Suspension of Disbelief opens Friday 26 April at VISUAL Centre for Contemporary Art Carlow. This group exhibition presents work by Denis Roche, with Emma Finucane, Brian Maguire & people using the mental health service in Carlow - Dolmen Studios. Professor Declan McGonagle, Director of the National College of Art and Design, will open the exhibition on Friday 26 of April 2013 at 6pm. Chaired by Professor Declan McGonagle NCAD. 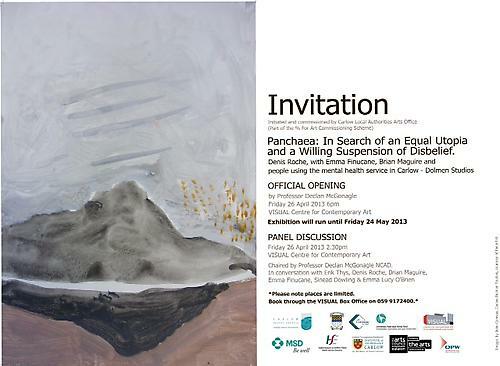 In conversation with Erik Thys, Denis Roche, Brain Maguire, Emma Finucane, Sinead Dowling & Emma Lucy O’Brien. *Places are limited. Booking through VISUAL Box Office on 059 9172400.